OK, that’s a lie, they would probably much rather be shooting a larger format camera but the ‘run and gun’ nature of the show confines them to HDV. I’m a huge fan of “No Reservations” and have often wondered how they shot it. I’ve seen what I thought was Camera Two appear in shots with an HDV rig (the SONY Z1U) but I always assumed Camera One was a full size 2/3″ rig–not so. The entire show is shot with two SONY Z1Us recording in 1080, 24P mode. I was also interested to discover that they rely almost entirely on existing light, occasionally using some home made LEDs for fill. All things considered, the show looks great for such low tech production values. The little SONY’s do a decent job though focus occasionally suffers from the lack of a full sized monitor. More incredible to me, each episode takes 10-days to shoot–not exactly a stressful shooting schedule! Anyway, if you would like to read more about the “No Reservations” production process, check out the full article at: http://www.dv.com/features/features_item.php?articleId=196604056. BEER & GEAR: CineTech Geek Out! Cool find. I would like to know about their editing environment and work-flow. 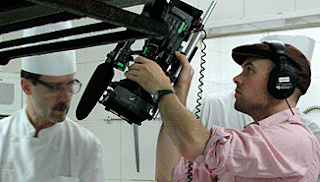 I love No Reservations!It looks like they shoot in Cineframe mode.I wonder if it’s Cineframe 24 or 30. I’d love to find out the show’s settings!Anyone know?